Took front clip off the Prius and ran the tape measure. What are the numbers? Wheel track? top to bottom of the drive train? These are the measurements I took when doing my research. I’ll get the new numbers today and post them later. Front track — 7.7 inches. Sounds like 3" fender flares (the Ghia body overhangs the wheels more than the Prius) unless you go for a lifted off-road look. If the struts fall inboard the valley in the fender that's good. Are the 32" and 34" measurements to the ground or to the bottom of the chassis? The measurements are from the ground. Plan on driving it while I prepare the Prius platform. 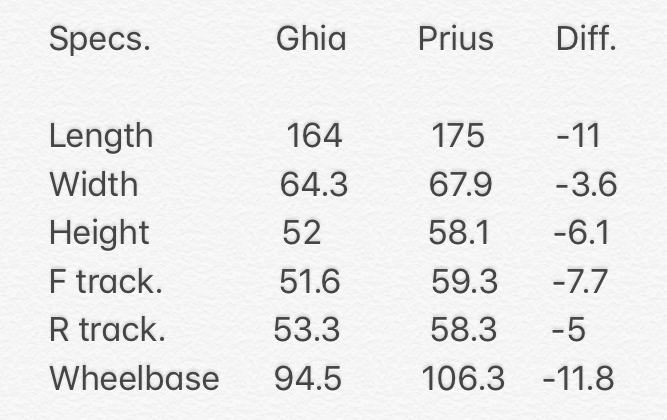 no driving noises in the ghia. darn. was wondering how thrashed it really was.